Turtle Islands are here for Global! !~ It seems they will appear every Monday and last 1 Hour. Each Run will cost you 15 Stamina. Tandems - Fixed damage Tandems can clear the Stages quickly. Don Krieg (MH-5 Gas Bomb) - His All enemies poison can definitely speed things up a notch. If you really need a DEX Unit and you aren't recovering from the debt you created during the Strawhat v2 event - Feel free to summon for a chance at getting a DEX Unit. Start saving your Rainbow Gems!!! 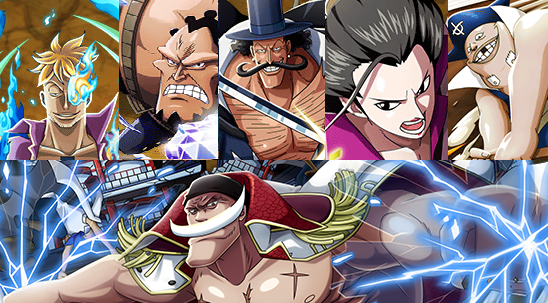 The Whitebeard Pirates will be the next Rare Recruit Batch! They will be out in 2-3 Months (Unless they move it up... again). Again - The Preview/Review for them will be up BUT you can choose NOT to read it. It will be reposted at a later date. So with Bandai moving things up, we DO have to polish up some dates and some things in general. So here's the new "Predicted Schedule". We hope this clears up some concerns! !